Solstice: the sun stands still. In temperate countries of the northern and southern hemispheres, every year there are two: summer and winter. The northern hemisphere’s summer solstice, which occurs on a day in the middle of the year (June 20 to 22, depending on the year), is the southern hemisphere’s winter solstice. Conversely, the southern hemisphere’s summer solstice, which occurs on a day in the third week of December (December 20 to 23, depending on the year), just prior to the New Year, is the northern hemisphere’s winter solstice. In the tropics, these astronomical events are not physically felt, except for the holiday celebration called Christmas that is associated with the northern’s hemisphere winter solstice and was brought by European Christian religions to countries like the Philippines, where I was born. Though we are more familiar now with the so-called Christmas season, connected with the winter solstice, there has always been something religious or spiritual about this time of year that antedates the Christian era. The traditions of caroling and midnight service, and common symbols in the celebration of Christmas, like mistletoes, decorated trees, candles and lights, wreaths and hollies, among others, were present in European paganism long before the advent of Christianity. Christmas is therefore the “Christianization” of the winter solstice celebration, whose institutionalization over time has led to the theft of most, if not all, of the major highlights from the pagan world. In the Hebrew scriptures of the Jewish religion, known as the Old Testament in the Christian Bible, there occurs a single instance of the word “solstice” that is not in any way associated with the annual summer and winter astronomical events. In the book of Joshua, chapter 10 and verses 12 to 14, it is reported that the tribal deity of ancient Israel, called YHWH, caused the sun to stand still in Gibeon to give the Israelites, known to be the people of the said tribal deity, the best opportunity to slaughter and annihilate, in broad daylight, an enemy tribe called the Amorites. This Lord, the sadistic tribal deity of ancient Israel, is a far cry from the god of love whose son, Jesus, is mythically believed by Christians to have been born sometime during the winter solstice and in whose honor Christians celebrate Christmas. By contrast to the murderous solstice of the Jewish story, the pagan winter solstice has always symbolized renewed hope, faith in the restorative cosmic forces and most of all, a love of life. Christianity, whose key figure, Jesus Christ, is a paragon of humility, should be humble enough not to monopolize the significance of the annual December 25 celebration. Deities from other religions whose births, in different periods, have been celebrated on the same date include: Attis and Dionysus, both of Greece; Mithra of Persia; Salivahana of Bermuda; Odin of Scandinavia; Crite of Chaldez; Thammuz of Syria; Addad of Assyria, and Beddru of Japan. The winter solstice has influenced the lives of many generations of humanity, through the passing of different civilizations. Therefore the universalizing slogan “Jesus is the reason for the season,” is inaccurate. A more logically acceptable statement for Christians is: “Jesus is our reason for the season.” An all-encompassing claim that articulates ownership of the winter solstice celebration, by claiming that Jesus Christ is the season’s only source of meaning, is a blatant audacity of narrow-minded fundamentalist and evangelical Christians. Christians should be more sensitive not to monopolize the winter solstice celebration and should acknowledge the fact that most—if not all—material symbolisms in Christmas originate from the pagan realm. The legacy of the ancient pagans is still carried on by modern pagans who continue to use the ancient material symbolisms inherited from their precursors with comparable spiritual intensity and pomp. It is tragic that the originally spiritual celebration of the pagan winter solstice has been ruined by the materialism of modern nominal Christianity. The modern winter solstice celebration has become commercialized and has lost, not only the graciousness originally associated with ancient pagan spirituality, but also the magnanimity of Christian virtues exemplified by the teachings of Jesus Christ. Even Christianity has been made seasonal by Christmas, which has become the only time of the year when nominal Christians affirm their shallow Christianity through their superficial adoration of their so-called Lord. I think that Christians, to be true to their commitment, should draw their inspiration and get moved to action not only during the Christmas season but also on a daily basis by the words of wisdom and example of Jesus. A truer spirit of Christianity might well reside in the pagan spirituality that has animated the ancient winter solstice celebration with its promise of renewed hope, faith in the restorative cosmic forces and love of life. Merry Yuletide Season to All! RUEL F. PEPA writes for News Junkie Post. If the aim behind promoting a draft resolution for the recognition of a Palestinian state is to recognise the Palestinian-ness of the land and undermine the legitimacy of settlement expansion, then the clauses [of this resolution], especially as they have been amended under US pressure, seek to reinforce the Israeli occupation and prevent any Palestinian political, cultural or armed resistance. The original draft of the resolution was already problematic to begin with without any amendments. The reason for this is that it demands the recognition of a Palestinian state based on 1967 borders and this ignores the very core of Palestinian rights, most notably the right of return for Palestinian refugees among other historical and legitimate demands. While the original draft makes no reference to compromising on Palestinian rights, it also does not make any explicit reference to the Palestinian right of return except to say that the plight of the refugees should be solved as it was outlined in UN Resolution 194. This claim does not adhere to the full implementation of the resolution but simply refers to it as a non-negotiable reference, which quite frankly is the problem in itself. The vague wording of UN Resolution 194 is so ambiguous that it presents a sort of loophole that gives officials the opportunity to fully ignore the right of Palestinian refugees to return to their homes. And yet, as if the ambiguity of this resolution was not enough for the United States, they also insisted on adding amendments that would force the Palestinian people to give up their original demands for the return of the original Palestinian state thereby giving up their claim to all of historic Palestine and the right of return. It is also wrong to assume that the extent of the injustices would stop at forcing the Palestinians to give up their right to historic Palestine in exchange for the establishment of a Palestinian state on less than 20 per cent of the original land with East Jerusalem as the sovereign and independent capital of Palestine. The new amendments outline that Jerusalem will be the joint capital among both sides, a suggestion that ultimately declares that the Israelis have the right to all of Jerusalem, which goes back to the Israeli suggestion that the Palestinian Authority can extend its mandate over Abu Dis and the surrounding neighbourhoods located just outside of Jerusalem. Thus, it is also not enough to prevent the Palestinians from establishing a Palestinian state or to allow them to establish some semblance of a semi-sovereign and geographically fragmented entity composed of the West Bank, Gaza and East Jerusalem as the new amendments now propose the idea of land swaps and completely ignore the illegitimate nature of Israeli settlements. These amendments not only wholly ignore the UN’s patchy attempts to salvage the remnants of the Palestinian state, but it also carves out large blocs of land as they are constituted by Israeli settlements and the annexation of the Jordan Valley among other pockets of land desired by Israel. In order to prevent the Palestinian people from practicing their right to determine their fate, two new amendments have been introduced and one of them prohibits both sides from making any unilateral decisions including land confiscations and the displacement of land owners, Israeli bombardments, preventing Palestinians from ascending to and accessing diplomatic channels and international forums, undermining all attempts at Palestinian resistance (to the occupation). All of these measures ultimately undermine all former international resolutions including the fourth Geneva Convention and the UN charter. Moreover, the Palestinian administration is, as always; keen to close all the outstanding gaps and build an impenetrable wall that confirms Israel’s conditions and outlook on the conflict, which could be as complex as preventing attempts at Palestinian resistance or as simple as preventing any information on the history of the Palestinian revolution from being broadcast on Israeli media because it confirms the historical claim and presence that the Palestinians have to the land. Finally, the emphasis that has been placed on ensuring Israeli security serves as a pre-requisite to any step forward with our without the US veto. What this ultimately does is hinder all progress and more importantly, renders the veto completely irrelevant as the amendments mentioned above secure Israeli interests. The Palestinian presidential administration must withdraw this resolution immediately. Israeli police yesterday broke into an Arab house belonging to the Qubran family in the Al-Ajami neighbourhood of Jaffa, Arabs48.com reported. The Israeli police razed trees and the garden, and handed over an eviction notice to the family ordering them to leave in order for the house to be destroyed. Israel has been putting pressure on the Arab population in Jaffa and the other cities in order to push them to leave their houses and land. Properties belonging to Arabs in the diaspora are sold to Jewish investors at auction. The Israeli Planning and Construction Committee escalated its activities against Arabs and their properties. Since the start of December, it has issued six demolition orders. Authorities also gave families in the Al-Nozha neighbourhood in Jaffa 30 days to evacuate their stores, claiming the Arabs have been using these stores illegally. The families will be forced to pay for the cost of demolition, Arabs48 said. A member of one of the families which were ordered to evacuate said the Israel Land Council refused to give them any documents leaving them unable to appeal against the eviction at the Supreme Court. Within the Quest text is a link to a chart by Dr. Richard A. Feely, who is a senior scientist with the Pacific Marine Environmental Laboratory (PMEL)—which is part of the National Oceanic and Atmospheric Administration (NOAA). Feely’s climate-crisis views are widely used to support the narrative. 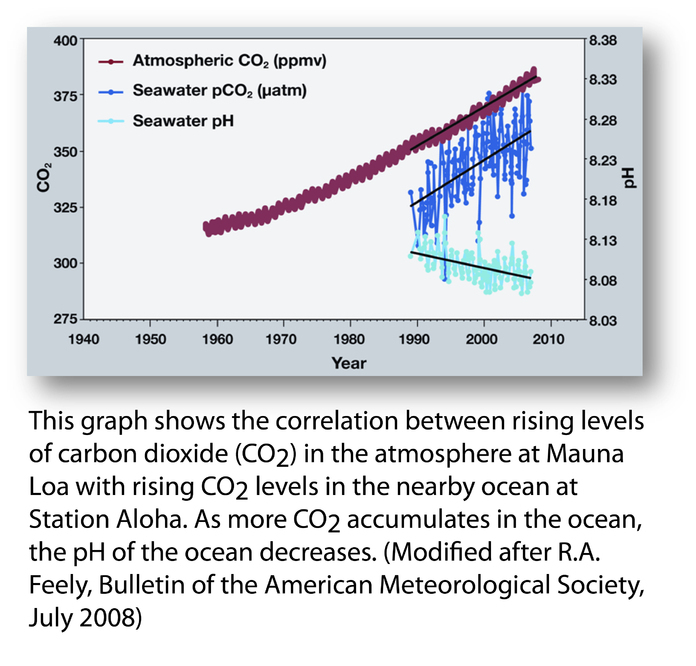 Feely’s four-page report: Carbon Dioxide and Our Ocean Legacy, offered on the NOAA website, contains a similar chart. This chart, titled “Historical & Projected pH & Dissolved Co2,” begins at 1850. Feely testified before Congress in 2010—using the same data that shows a decline in seawater pH (making it more acidic) that appears to coincide with increasing atmospheric carbon dioxide. However, an inquisitive graduate student presented me with a very different “lesson” on OA research. Mike Wallace is a hydrologist with nearly 30 years’ experience, who is now working on his Ph.D. in nanogeosciences at the University of New Mexico. In the course of his studies, he uncovered a startling data omission that he told me: “eclipses even the so-called climategate event.” Feely’s work is based on computer models that don’t line up with real-world data—which Feely acknowledged in email communications with Wallace (which I have read). And, as Wallace determined, there is real world data. Feely, and his coauthor Dr. Christopher L. Sabine, PMEL Director, omitted 80 years of data, which incorporate more than 2 million records of ocean pH levels. Wallace sent Bard an email: “I’m looking in fact for the source references for the red curve in their plot which was labeled ‘Historical & Projected pH & Dissolved Co2.’ This plot is at the top of the second page. It covers the period of my interest.” Bard responded and suggested that Wallace communicate with Feely and Sabine—which he did over a period of several months. Wallace asked again for the “time series data (NOT MODELING) of ocean pH for 20th century.” Sabine responded by saying that it was inappropriate for Wallace to question their “motives or quality of our science,” adding that if he continued in this manner, “you will not last long in your career.” He then included a few links to websites that Wallace, after spending hours reviewing them, called “blind alleys.” Sabine concludes the email with: “I hope you will refrain from contacting me again.” But communications did continue for several more exchanges. In an effort to obtain access to the records Feely/Sabine didn’t want to provide, Wallace filed a Freedom of Information Act (FOIA) request. 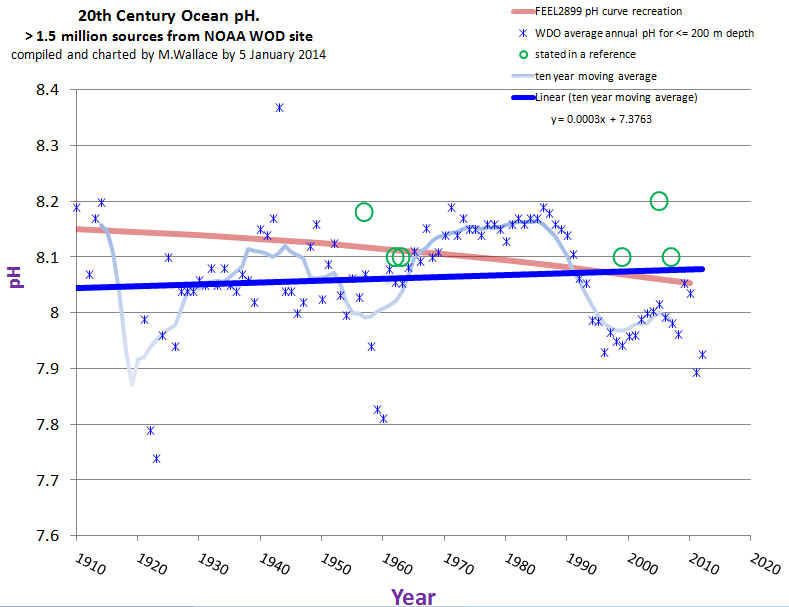 In his last email exchange, Wallace offers to close out the FOIA because the email string “clarified that your subject paper (and especially the ‘History’ segment of the associated time series pH curve) did not rely upon either data or other contemporary representations for global ocean pH over the period of time between the first decade of 1900 (when the pH metric was first devised, and ocean pH values likely were first instrumentally measured and recorded) through and up to just before 1988.” Wallace received no reply, but the FOIA was closed in July 2013 with a “no document found” response. As a taxpayer who is helping to pay your salary I’d like to know why you are refusing to include all the data on ocean acidification that is available. As a public servant that must stick to the rigor of the scientific method and only present data that is of sufficient quality to address the question, I am obliged to report the best evaluation of ocean chemistry changes available. This is what you pay me to do and I am working very hard to give you the best value for your tax dollar every day. I hope you are having a good holiday season. Who determined that the directly measured ocean pH data was not of “sufficient quality” and if it wasn’t, why then did NOAA make the data available on their website as part of other ocean data in their World Ocean Database without a caveat? JERUSALEM – Israeli forces on Wednesday afternoon shot a 5-year-old Palestinian child in the face with a rubber-coated steel bullet in East Jerusalem as he was getting out of a school bus on his way home, relatives said. “An Israeli soldier fired a black rubber-coated bullet at the child from a close distance, injuring him under the eye,” the uncle of 5-year-old Muhammad Jamal Ubeid told Ma’an. The incident reportedly took place in the East Jerusalem village of al-Issawiya, where Muhammad’s family lives. The child’s uncle said that Muhammad and his 14-year-old sister stepped out of a school bus and had started to walk home when the Israeli forces shot him. The uncle said there were no confrontations at all in the area between Israeli forces and Palestinians at the time of the shooting. An Israeli police spokesman did not return a request for comment. Muhammad was evacuated to the nearby Hadassah Medical Center on Mount Scopus where medical authorities said he had a fracture in the bone below his eye. The boy was later transferred to the Hadassah Medical Center in the Ein Karem neighborhood in West Jerusalem for treatment. East Jerusalem neighborhoods like al-Issawiya have seen months of heavy police presence and widespread protests amid increasing anger over the Israeli occupation and perceived discrimination. Israel captured East Jerusalem from Jordan in 1967 and later annexed it in a move never recognized abroad. The international community sees East Jerusalem as Palestinian territory. It might be easy to assume that the United States’ ignoring of the horrific suffering in Palestine, suffering it caused by its military and financial support of Israel, is just part of the general racism inherent in U.S. culture. Despite civil rights laws, and the U.S.’s self-proclaimed status as a free country, the world knows that racial inequality is rife within U.S. society. This racism has been on ugly display with the recent killings of Michael Brown in Ferguson, Missouri, and Eric Gardner in New York City, both unarmed African-Americans, and both killed by white police officers. That a grand jury in each jurisdiction failed to see any reason to indict either of them just adds evidence to the blatant fact of institutional racism in the U.S. The U.S. has three main reasons, it will tell the world, for assisting a suffering people: 1) an oppressed people are struggling for the basic right of self-determination, as in Iraq in 2003; 2) a war or other destructive conflict has ended, and either or both parties are in need of support to rebuild homes and infrastructure, as it did following World War II (we don’t need to mention here that the U.S. caused a lot of that destruction), or 3) a natural disaster has hit, causing death, homelessness and leaving a major population at risk of starvation and disease, as in Haiti, in 2005. However, as noble as these lofty goals are, they are not universally applied. Let us look at one nation that is experiencing events in each of those categories, and is yet to see any assistance from the United States. The people of Palestine were expelled from over 50% of their nation’s lands over sixty years ago. They had no say in this decision, received no compensation for the loss of their homes, farms and lands, and were driven into refugee camps. Since that time, hundreds of thousands more have been driven from their homes; their schools, hospitals, mosques and museums have been destroyed, and they now live under occupation in a small fraction of the land that comprised their nation for centuries. During the original expulsion, at least 10,000 Palestinians were killed. Since that time, tens of thousands more have been killed, with no one held accountable for these deaths. Genocide is defined as the eradication of a people and their culture; it is clear that what has been happening to the people of Palestine is genocide. Resistance by the Palestinians, a legal right for an occupied people according to international law, takes many forms. There are weekly non-violent demonstrations in the West Bank, yet ‘non-violent’ may not be the correct term. Palestinians demonstrate non-violently, but IDF (Israeli Defense Forces) terrorists will arrest, shoot and kill these demonstrators. In the Gaza Strip, some materials can be smuggled in to build what Dr. Norman Finkelstein, the son of Holocaust survivors and a vocal advocate for the rights of the Palestinian people, calls ‘enhanced fireworks’. These are sometimes shot into Israel, with little or no effect. So this oppressed population, seeking the basic right of self-determination, would, it might seem, be eligible for U.S. support. After all, back in 2012, then Secretary of State (and probable 2016 Democratic presidential candidate) Hillary Clinton said this in regard to Syria: “We reject any equivalence between premeditated murders by a government’s military machine and the actions of civilians under siege driven to self-defense.” Now, would it be unrealistic to consider a brutally occupied nation to be ‘under siege’? Would not such a people, as Mrs. Clinton so eloquently expressed, be ‘driven to self-defense’? One might think so. Well, since for some bizarre reason the Palestinians don’t qualify for U.S. help under the first criterion, let us look at Door Number 2: war or other destructive conflict. What occurred in the Gaza Strip in July and August of this year was not a war; it was simply a slaughter. Israel, with the full backing of the U.S., which has provided it with a powerful military system, with as many of the world’s most highly advanced weapons as Israel wants, bombed and invaded Palestine, a country with no army, navy or air force. Independent sources have said that the destruction is the worst that has been seen anywhere in decades; thousands died, and tens of thousands were rendered homeless. Electricity is available for only a few hours a day, and much of the water is not fit to drink. This must be viewed as a destructive conflict. Yet, curiously, the U.S., with such a huge percent of the world’s wealth, has not rushed in. Yet it continues to send Israel aid at the rate of nearly $9 million dollars every single day. Well, it seems that, for some inexplicable reason, Palestine still doesn’t qualify for U.S. largesse. Let’s look at the third reason the U.S. says it rushes in to assist: natural disasters. Following Israel’s fifty-one day bombardment and invasion of Palestine, rains caused flooding, which further eroded the quality of drinking water, and risked disease. In addition, the tens of thousands of people who were rendered homeless by Israel’s attack had to find shelter where they could: in buildings still standing that may have been damaged to the point of being unsafe; by quickly assembling make-shift shelters from whatever parts of destroyed buildings they could use, or by crowding in with anyone lucky enough to still have a home. This, it would seem, is the kind of suffering that provides countless photo opportunities for U.S. politicians to showcase their concern for the less fortunate. And yet, the amount of aid sent to Palestine by the U.S. remains at zero. Why, any intelligent person may ask, is this the case? One hates to be crass, but with the U.S’s elected officials, there is no greater priority than their own re-election. The right of self-determination, freedom, human rights, the basic survival needs of a suffering people all take a distant back seat to the grasping, clutching need to gain every dollar possible for re-election campaigns. And the Israeli lobby, through the American Israel Political Affairs Committee (AIPAC), is extremely generous to the elected officials it has bought and paid for. And these officials don’t come cheap. Between 2008 and 2014, Israel lobbies’ contributions to U.S. senate campaigns cost a whopping $12,036,252. And to purchase members of the House of Representatives, those lobbies spent $4,961,445 in just two years (2012 – 2014). So, one would be unfair indeed to say that the U.S., in causing and then ignoring the horrific suffering of the Palestinian people, was merely acting out its own inherent racism. After all, these are Arabs we’re talking about, which might lead one to that conclusion. But no, that is an unjust characterization of U.S. governance. We can all be assured that, if there were a rich, powerful American Palestine Political Affairs Committee (APPAC), the U.S. would be pouring billions of dollars into Palestine, sending advisors, providing a peace-keeping force to prevent Israeli aggression, supporting every proposal the United Nations advanced that favored Palestine. U.S. presidents would speak at APPAC conventions, say how they are ‘Palestinian in their hearts’, and describe the U.S. as Palestine’s closest ally. So it isn’t racism, after all. While recent domestic events should remove any doubt anyone may have still had that the U.S. is a racist society, one must not blame that racism for the way the U.S. treats Palestine. No, that is a result of greed, not racism. One must keep one’s vices straight. One looks in vain for U.S. citizens to remove the blood-stained glasses, and see the U.S. clearly. Its elected officials don’t represent anyone but the powerful lobbies who buy their offices. The nation doesn’t stand for peace and freedom, but for corporate profits and the wars that enrich the already rich. And human rights aren’t worthy of consideration, if they stand in the way of power or profit. This is the U.S. as it is today, and always has been. He is upgrading the lethality level of an atomic arsenal already so deadly it can destroy all life on Earth. Then he’ll send Mr. and Mrs. America the bill, estimated by one Federal study at $1-trillion, to pay for the deadly upgrades he wants, rather than the peaceful improvements Americans need. What’s more, “Painstaking efforts have also gone into improving their delivery accuracy” and when the results of these combined activities are summarized for Russian political leaders, “it is not hard to understand their alarm.” Postol asserts that it is the U.S. that has pushed the Russians to a higher state of alert. Despite Mr. Obama’s recognition that peace depends on nuclear disarmament, Postol says, “the US is making those nightmare scenarios more likely by rebuilding the stockpile of atomic warheads as if they were just another form of conventional weapon.” They aren’t. When Russia was communist and occupying much of Eastern Europe, U.S. leaders claimed they had to be armed to the teeth. Now that the Russians have scrapped the failed Bolshevik system, have become largely capitalist, and have withdrawn from Eastern Europe, President Obama is ratcheting up the same old tensions. Only now the game he is playing is much more dangerous than ever. As usual, there weren’t any “denier” headlines. Which raises an obvious question: How is climate messaging almost always alarming, if industry is pulling all the strings? A prevailing belief about climate change is that all of humanity — all 7 billion of us — is collectively responsible for industrial greenhouse gas emissions. But that is not strictly true. About 63 percent of all industrial emissions since 1854 have come from 90 companies, many of them coal and oil and gas producers, according to a report by the Union of Concerned Scientists. Proctor said that industry’s idea for hoisting responsibility for the climate problem onto individual shoulders was derived from the tobacco industry. In the ’90s, tobacco companies ran media campaigns that equated smoking with freedom of choice. This placed responsibility for their addiction on individuals rather than on industry. This perception can be flipped, and industry can be denormalized and shown to be dishonest, Proctor said. This is wacky stuff, akin to suggesting that the alphabet is responsible for Prof. Proctor’s doctoral thesis. As reported, he claims that individuals don’t cause climate change, because most greenhouse gases have been emitted by a relatively small set of industries. Left unsaid (at least as reported) is the fact that industry’s emissions are the direct byproduct of meeting consumer demand—i.e., that of the individual. Moreover, the happy consequence of this process (i.e., meeting consumer demand) has been the unprecedented acceleration in quality of life enjoyed by *individuals* since the industrial revolution.